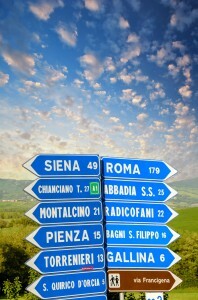 Home > Blog > Italy’s challenging roads! Four of the France Motorhome Hire team just got back from a trip to Tuscany, Italy to collect new motorhomes and it reminded us how fantastic the roads are here in France! There is no doubt that there are some truly wonderful sights, flavours and things to do in Italy but it is nothing like as easy as France to explore in a motorhome or campervan. The Italian people are very welcoming and their country, food and wine is stunning but travelling between the highlights is very different to France and some of the driving conditions are truly challenging. The recession must have taken it’s toll on the Italian road budget because even some of the motorways are now in very poor condition with big potholes and noisy, rough surfaces galore. Progress can be glacial so don’t try to cover big distances in a short trip, it is just not possible. The motorways can be narrow, rough and busy with lots of big, slow trucks so you can’t sit in the fast lane at full cruising speed to cover the miles. There are literally long stints of motorway where you cannot overtake a truck because there just is not room to do so. The non-motorway roads are very different to France where there are plenty of places to stop and trickling through pretty villages is all part of the charm. 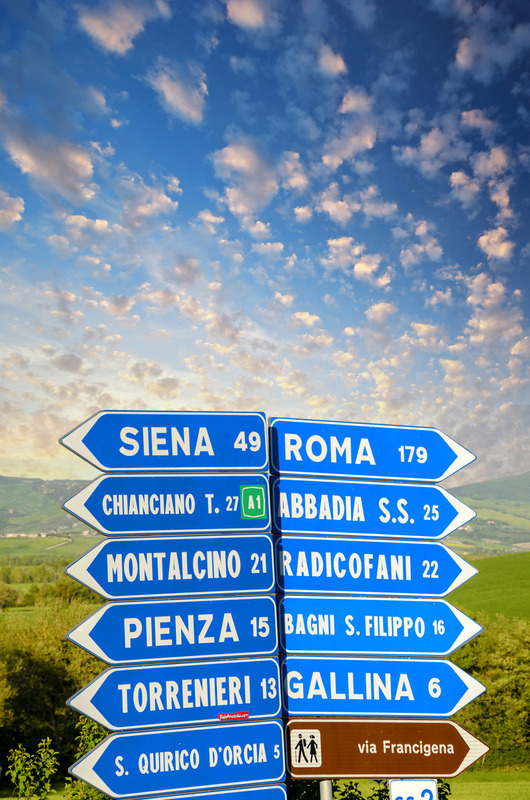 In Italy you can drive for miles and find nowhere to pull up – charming or otherwise! The roads are busy too so you have to concentrate fully to thread your way through the traffic. Hesitation at junctions is not tolerated so make sure you know your route or have a reliable GPS if you want to avoid being bullied along by the locals! Allow extra time for finding places to spend the night, empty tanks and fill up with water. There are very few places you can stay overnight outside of the campsites so it’s best to either book ahead and have a firm plan or allow a good couple of hours to find somewhere you can spend the night (don’t plan to arrive in an area late in the day and start looking as it can be very frustrating). The campsites are usually well-run by warm and friendly people so it is worth heading for one if you can. Motorhome service points and free overnight halts seem to be commonly vandalised or not maintained (except the ones on the motorways, which are NOT nice places to stay) so fill up your water tanks and empty your toilet and waste tanks whenever the opportunity arises. In France you might not see a Gendarme in two weeks but in Italy the Police are everywhere (mainly manning roadside speed traps) so stick to the speed limit and observe the rules of the road to avoid being pulled over. Fuel and road tolls are very expensive in Italy so fill up in France before you cross the border. Diesel in France today is around €1.30 per litre but we paid up to €1.85 per litre in Italy so make sure your tank is full before you cross the border. Road tolls are very expensive on the motorways (you can check the road tolls for specific journeys on a website like www.viamichelin.com as you plan your trip to avoid any unexpected expense). The two main routes into Italy from France (via either The Frejus Tunnel or the Mont Blanc Tunnel are around €60 each way) so don’t head into Italy for a one day break! As one of France’s most famous and attractive neighbours, Italy is a common destination for our clients and most come back having enjoyed all the country has to offer but touring there is very different to touring in France so be prepared for that difference. The best advice we can give is simply not to try and fit too much in. Take it easy and don’t expect to cover big distances or stick to an overly ambitious schedule. Have a couple of hours slack in each day so you don’t finish up under pressure to find somewhere to shop/eat/stay, just as everything closes and you are getting tired. We are truly spoilt in France with incredibly well maintained, quiet roads, plenty of places to stop and many beautiful and varied regions to discover. France is probably the best country in the world for a campervan trip – you wouldn’t run out of new things to see and do here or pretty villages and fantastic sights to explore in a year or more – so think of closer to our base too when planning your European adventure.